Sen. Marco Rubio (R., Fla.) ripped the Turkish celebrity chef known as Salt Bae this week for serving Venezuelan President Nicolas Maduro while his people starve. Rubio insulted the chef, whose actual name is Nusret Gokce, on Twitter Monday and then Tuesday told reporters in the Senate halls he was "pissed," according to video from The Hill. He said it was an "outrage" and "disgusting" to post a video with Maduro in Istanbul, saying that’s why he shared the phone number to Gokce’s Miami restaurant for people to call and complain. "This guy [Gokce] is here feasting him, eating this five-star gourmet meal and smoking fine cigars while the people of Venezuela are literally–I'm not exaggerating–literally starving," Rubio told reporters. "This is not a man I disagree with ideologically. This is a man who is starving human beings and this guy here [Gokce] is celebrating him as some sort of hero. I got pissed." Rubio initially reacted to the story by blasting Gokce and Maduro in a series of tweets. "I don’t know who this weirdo #Saltbae is, but the guy he is so proud to host is not the President of #Venezuela. He is actually the overweight dictator of a nation where 30% of the people eat only once a day & infants are suffering from malnutrition," Rubio tweeted Monday night. Then he tweeted the phone number of Gokce’s restaurant in Miami, for which he was criticized for potentially opening up constituents who work at the restaurant to harassment. Tuesday, he defended himself against that charge and got in a dig at Gokce’s restaurant for its poor reviews. "All I gave is the phone number; they should call the restaurant and complain about what the owner of the restaurant did. I haven't asked them to do anything but that," Rubio said. "This is an expensive restaurant, probably overpriced according to some of the reviews I’ve read." Gokce has also honored the deceased Cuban dictator Fidel Castro, which riled Florida’s Cuban-American population. 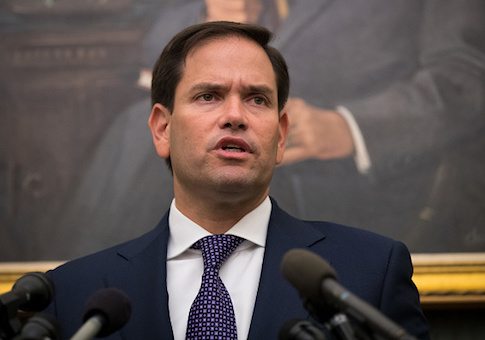 Rubio said his criticism was not about a political difference but about standing up against Maduro’s drug-trafficking crimes and brutal dictatorship. "I don't care what people’s politics are domestically. I have never gone after anybody in business because they have a view of politics different from mine on a domestic matter. This is not a domestic political disagreement," Rubio said. "This is a criminal." This entry was posted in Issues and tagged Marco Rubio, Nicolas Maduro, Turkey, Venezuela. Bookmark the permalink.